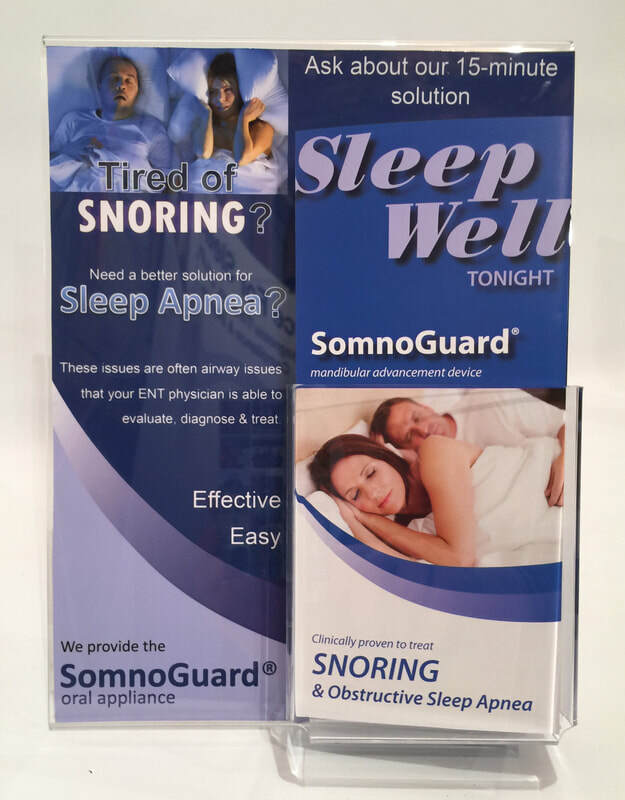 Presenting the convenient, effective and affordable SomnoGuard solution for Snoring & Sleep Apnea is now even easier with a video presentation for your waiting room. The vast number of individuals personally suffering with disruptive Snoring or OSA, or with loved ones or associates that are, leads this topic to be of extremely high interest and instigates inquiries from patients that will lead to numerous airway maladies that you are able to address. This will include helping them address their snoring and OSA, but has also proven to illuminate concurrent issues such as nasal, sinus and allergy. Employing this highly complementary service within your comprehensive airway practice will benefit you and your patients in optimizing their outcomes and quality of life. Available as part of the MediPlay service library, or as an independent downloadable video file, the waiting room presentation works in partnership with our Patient Education Brochures and static displays to promote your ability to serve your patient's needs. To assist the process of administering the Oral Appliance Therapy into your practice, please find the following supporting documents to use a references for your practice. These are made available in .PDF form and MS Word form for easier editing. No warranties or indemnifications are extended with these documents as they are provided as samples only. Downloading, revision and use is at your discretion. While widely covered by US Commercial Insurers, any sleep related services are subject to medical necessity criteria, policy exclusions, new higher deductibles and review upon claim submission. Responsibility for Insurer denials and patient payment for any reason are clearly stipulated with this document that presents a clear explanation of prepaying the service and reimbursing the patient upon remittance or EOB. This STATEMENT OF FINANCIAL RESPONSIBILITY provides an approved and documented chain of communication to ensure patient acknowledgement of potential financial responsibility. CMS policies on Oral Appliance therapy typically require that a Fully Custom Fabricated Appliance (only a handful actually meet all criteria) be provided solely by a Dentist and the dentist must be registered as a DEM provider with CMS. Also subject to part B's 20% coinsurance, many patients elect to proceed with the Somnoguard on a patient pay basis, but must sign this ABN to document that arrangement BEFORE providing Meiare patients with the Therapy. Utilize to document Mild to Moderate OSA (AHI/RDI 5 - 30) or Severe with failed or concurrent CPAP use. To be submitted with Sleep Study results for preauthorization (when required) and for Claim Submission. Reference guide for practice and patient coordinators to reference and assess appropriate patient management for Oral Appliance Therapy. We are pleased to provide this Patient Education Brochure stand to increase awareness of your practice capabilities within your waiting room or exam room. Available as a 8.5" x 11" Table Top display, the display promotes your capabilities to serve your patient's Snoring and OSA needs and provides a convenient place to hold the Patient Education Brochures (available separately). To request your complimentary display(s) please reference our Practice Support Order Page, call your Clinical Specialist or Customer Service at 866-720-8080. The 3 Step fitting process of the SomnoGuard family of Oral Appliances enables both precise and long-lasting IMPRESSIONS as well as a patient specific Bite REGISTRATION to be obtained in a single 10-15 minute office visit. This quick reference guide will help refresh your memory of the process prior to fitting sessions. Instructions on timing, sequence, trimming and Titration are incorporated. Identifying patients that can benefit from your comprehensive Sleep Services can be as close as your own Waiting or Exam Room. The STOP-BANG questionaire is a validated Screening Tool to help patients easily identify potential indications of Sleep Disorders without any deliberations or tallying of scores (like the Epworth Questionaire). A simple YES to three or more of the Yes/No questions compels action upon reviewing this piece while waiting for appointments or to take to friends/family that are dealing with Snoring/Sleep issues. Reports of 400% increases in Sleep related services has been reported with the use of this simple, yet effective screening tool.